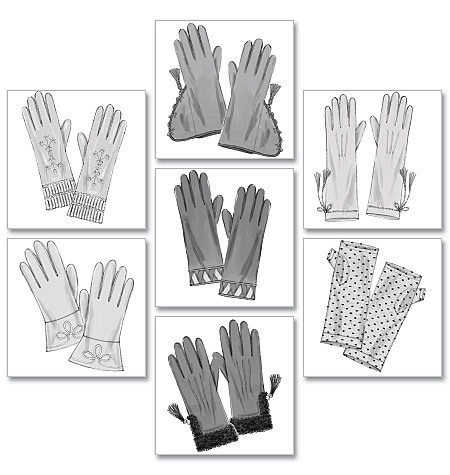 HISTORICAL GLOVES: Package includes patterns and instructions to make seven pairs of historical unlined gloves A, B, C, D, E, F, G. Each glove is available in size small − 7", medium − 8" and large − 9". E: contrast self-lined band and strip. G: lined lower sections. NOTIONS: Gloves B: 13/4 yds. of 1/4" Decorative Cord and Two 3" Tassels. Gloves C: 3/4 yd. of 4" Fur Trim and Two 2" − 3" Tassels or Two Skeins of Embroidery Floss, Two 16mm x 12mm Beads and Two 15mm x 6mm Bead Caps. Gloves D: 53/4 yds. of 1/8" Suede Lacing and 11/4 yds. of 1/4" Double Fold Bias Tape. Gloves E: 11/4 yds. of 1/8" Cord. Gloves F: 11/4 yds. of 1/4" Flexible Braid, One Skein of Embroidery Floss, Twenty-four 7mm and Seventy-four 4mm Acrylic Stones and Jewel Glue. Gloves G: 11/2 yds. of 1/8" Soutache Braid. FABRICS: Gloves A: Mesh and Lace. Gloves B, F: Stretch Charmeuse and Stretch Satin. Gloves C: Jersey. Gloves D, E, G, also for C: Stretch Micro Suede and Stretch Synthetic Leather. Additional Fabric may be needed to match stripes, plaids or one-way design fabrics.